The laser can cut seemingly impossible hole and profiling configurations that conventional punches and dies cannot. This saves time and the cost of producing special contour tooling and allows engineering changes to be easily incorporated. 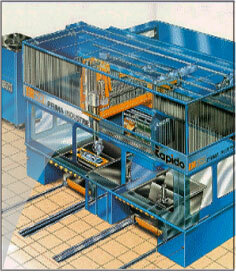 The non-contact nature of this process eliminates material distortion which in turn reduces scrap costs. The laser cuts carbon steel, stainless steel and aluminum by directing the output of a high power laser – by computer – at the material to be cut. The material then either melts, burns, or vaporizes, leaving an edge with a superior quality surface finish that’s free of burrs. When used in conjunction with our metal stamping and deep draw services, we’re able to achieve a high degree of precision, design flexibility and significant tooling cost savings. Why not call us today to learn more about our laser cutting services? Let’s talk about how we could save you money on your metal stamping or deep draw stamping projects. For over 15 years, our 4th generation family business has relied on Crosby to supply us with hundreds of thousands of mild steel and stainless steel stamped parts. It’s been an easy decision to stay with a supplier that provides consistently high quality and reliable delivery with the competitive pricing we need. We have also come to appreciate some of their secondary capabilities, such as laser cutting and e-coat. They have not let us down. As an Aerospace and Defense company we are honored to have The Crosby Company as our main metal stamping supplier for over 25 years. The Crosby Company has maintained a 100% on time delivery. Quality, On time delivery, Customer service, and Cost effect pricing are all key components our industry needs to keep our customers safe and on schedule. The Crosby Company adapts well to the multitude of changes involving our drawings and delivery schedules. The Crosby Company provides competent engineer support, and works in concert with our engineer staff to better understand our changing needs. If I was to define the Crosby Company in a single phrase, it would be, “Can do, plus will be, equals have done.